I’m going to let you in on a little secret: I’ve never had lasagna soup before. It’s just not really thing I’d ever grown up with. But it’s apparently a thing that some of you have grown up with because I’ve been getting requests to veganize this recipe for some years now. I admit it, I put it off, it just didn’t really sound super yum to me. Well, I finally decided to give it a go this week, and let me tell you, it’s actually the best. It’s THE BEST!!! 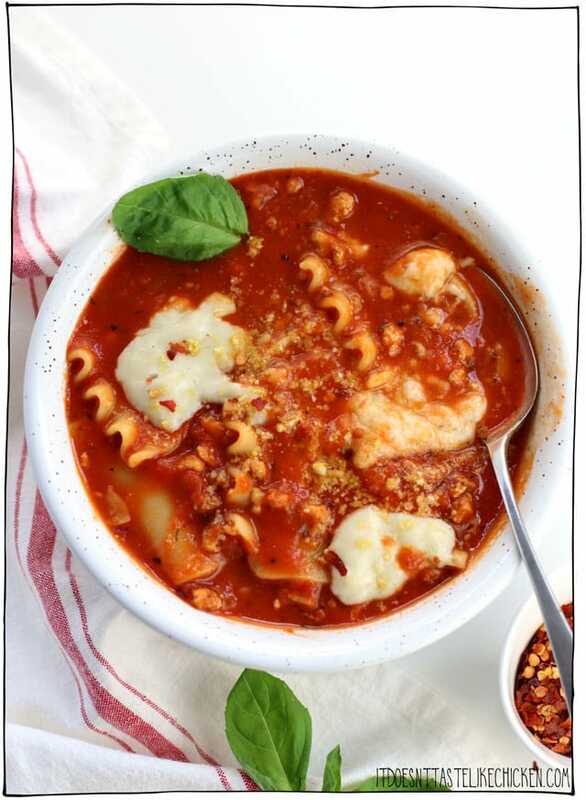 Vegan lasagna soup is this marvellous combination of all my favourite things and I didn’t even realize it: pasta, tomato sauce, my beefy tofu crumbles, and melty vegan cheese, all in a bowl of pure comfort food bliss. I have totally fallen in love and this will become a new go-to meal for me. 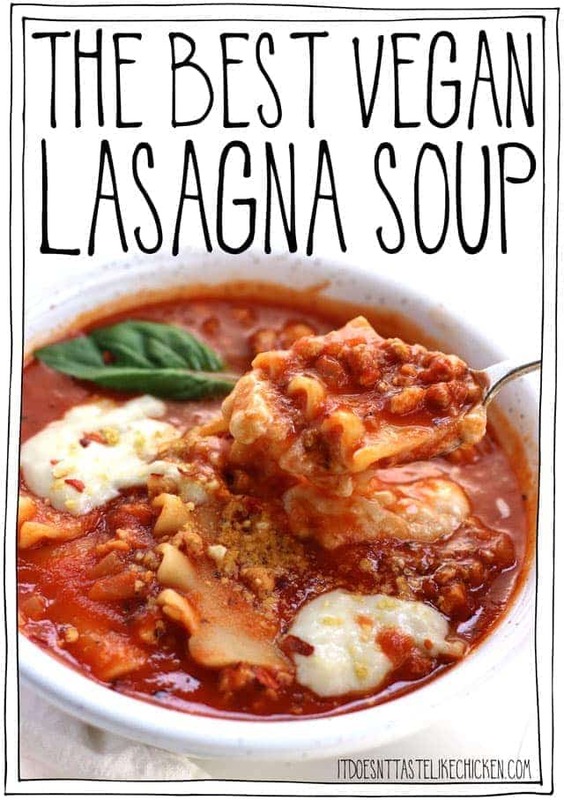 I introduce you to the best vegan lasagna soup ever! (In my opinion). …and in my boyfriend Adam’s opinion too. He’d never had lasagna soup before either but was blown away by its scrumptiousness. We both agreed that we like vegan lasagna soup even more than actual lasagna! No for real. It’s so saucy delicious. If you are one of those people who would add extra sauce to your serving of lasagna, then this dish is for you. Adam was delighted when I told him we would be having it for dinner two nights in a row, and you know a dish has got to be really good when it’s on repeat in a cooks house! This isn’t the quickest recipe to prepare and it’s not the shortest list of ingredients either, but every step is super easy and is totally worth the effort. 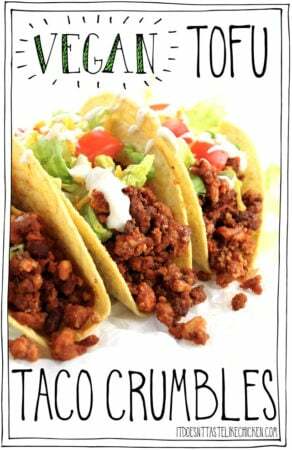 I use my tofu crumbles, a technique I have used in my bolognese, chili, and tacos, so you may already be familiar with it. Then from there, it’s just a very simple tomato soup base, the pasta noodles get cooked right in the soup, and you can decorate the soup with whatever toppings you like! Vegan cheeses, fresh basil, or crushed red chili flakes. To make the best vegan lasagna soup ever: mix the nutritional yeast, soy sauce, olive oil, chili powder, garlic powder, and liquid smoke together in a large bowl. It will make a brown paste-like texture. Crumble the block of tofu with your fingers into the bowl along with the seasoning. Mix the tofu crumbles with the seasoning making sure all of the tofu is evenly coated. Spread the tofu crumbles evenly over the pan. Bake for 35 to 45 minutes, stopping to stir the tofu every now and then. Keep a close eye on it towards the end so that it doesn’t burn. You want the tofu to be nice and browned. The smaller crumbles will be darker than the larger crumbles, and that’s ok because it will provide a variety of texture. If you want to see a few more pictures on how to do this, hop over to my Tofu Bolognese recipe which uses the exact same crumbles. In the meantime, in a large soup pot, heat the oil over medium-high heat. When hot, add the onion and garlic and sauté for about 5 minutes until the onions have turned translucent and begin to brown. Stir in 6 cups of vegetable broth, the crushed tomatoes, oregano, and basil. Bring to a simmer and cook for 10 minutes. 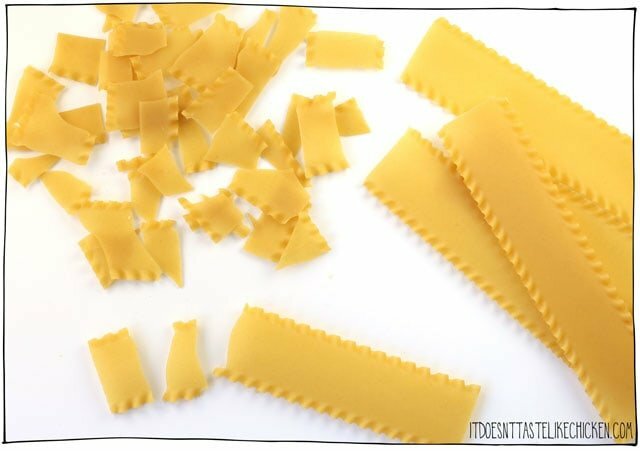 After 10 minutes, stir the broken lasagna noodles into the soup and continue to cook for 7 – 10 minutes until the noodles are al dente, stirring often so they don’t stick to each other. *If you are using a gluten-free noodle, cook the noodles separately according to the package directions and then stir them in. Some gluten-free noodles can get kind of slimy when cooked straight in the soup. *If you plan to prepare this soup ahead of time, I also recommend cooking the noodles separately closer to when you are ready to serve, as they will continue to get softer the longer they sit in the soup. Lastly, stir in prepared tofu crumbles and cook for 1 more minute to heat through. The tofu crumbles and pasta will soak up the soup so if it gets too thick, feel free to add more vegetable broth or water as needed to reach the desired consistency. I found that I didn’t need any added salt or pepper as there was plenty in the vegetable broth I used, but of course, feel free to season to taste. To serve, divide among bowls and garnish with toppings of choice. I topped mine with dollops of my vegan mozzarella, a sprinkle of parmegan, and fresh basil. But this vegan lasagna soup is so tasty that I have enjoyed it as is without any added toppings. 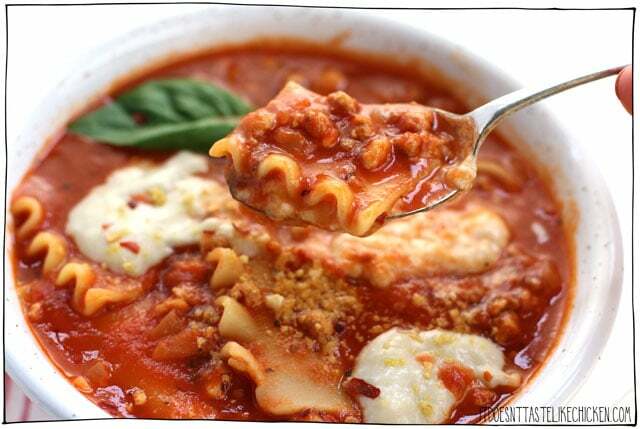 This easy to prepare soup is made with homemade beefy tofu crumbles, a simple tomato soup base, and lasagna noodles cooked right in the soup. Top with melty dairy-free cheese and fresh basil, all in a bowl of pure comfort food bliss! Mix the nutritional yeast, soy sauce, olive oil chili powder, garlic powder, and liquid smoke together in a large bowl. It will make a brown paste-like texture. Crumble the block of tofu with your fingers into the bowl along with the seasoning. (No need to press the tofu first, the excess water will bake out in the oven). Mix the tofu crumbles with the seasoning making sure all of the tofu is evenly coated. Spread the tofu crumbles evenly over the pan. Bake for 35 to 45 minutes, stopping to stir the tofu every now and then. Keep a close eye on it towards the end so that it doesn't burn. You want the tofu to be nice and browned. 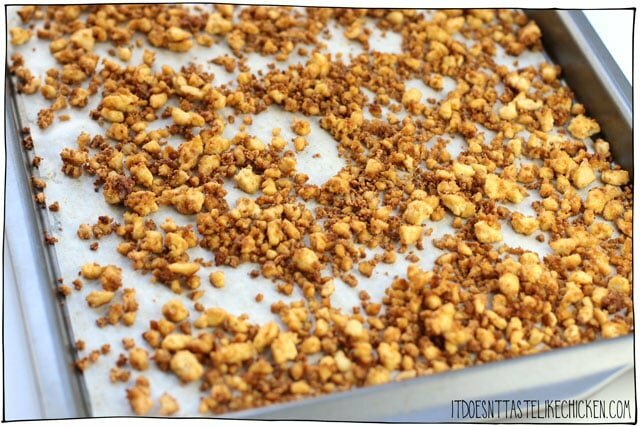 The smaller crumbles will be darker than the larger crumbles, and that's ok because it will provide a variety of texture. In the meantime, in a large soup pot, heat the oil over medium-high heat. When hot, add the onion and garlic and sauté for about 5 minutes until the onions have turned translucent and begin to brown. Stir in 6 cups of vegetable broth, the crushed tomatoes, oregano and basil. Bring to a simmer and cook for 10 minutes. 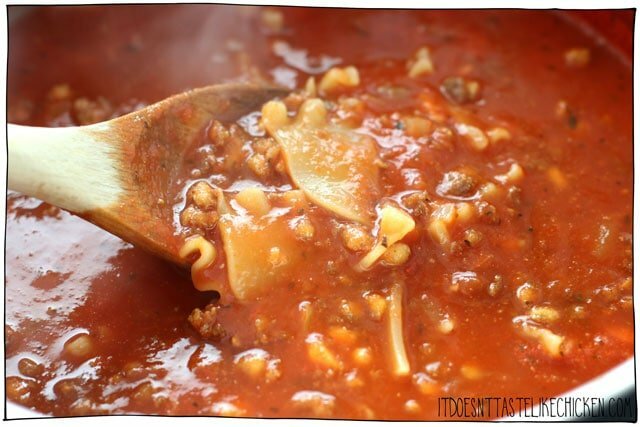 After 10 minutes, stir the broken lasagna noodles into the soup and continue to cook for 7 - 10 minutes until the noodles are al dente, stirring often so they don't stick to each other. Lastly, stir in prepared tofu crumbles and cook for 1 more minute to heat through. The tofu crumbles and pasta will soak up the soup so if it gets too thick, feel free to add more vegetable broth or water as needed to reach the desired consistency. To serve, divide among bowls and garnish with toppings of choice. If you are using a gluten-free noodle, cook the noodles separately according to the package directions and then stir them in. Some gluten-free noodles can get kind of slimy when cooked straight in the soup. 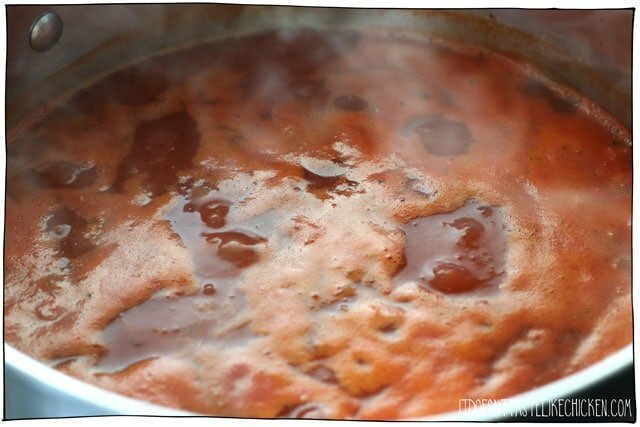 If you plan to prepare this soup ahead of time, I also recommend cooking the noodles separately closer to when you are ready to serve, as they will continue to get softer the longer they sit in the soup. This was so easy to make! The Tofu Crumbles are a wonderful addition. A very filling soup that was also so incredibly tasty! Thanks Sam! You make me a better cook for my family. 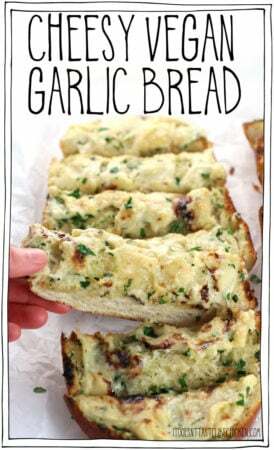 Hi Sam, this recipe was amazing and really easy too, I loved it!!!!! Great recipe!!! My husband said that this was what he always wished lasagna was! We used whole wheat noodles and stirred in some fresh spinach at the end. The cheese is terrific. I can’t wait to use it in other ways. You’re most welcome, Jess!! For future reference, you can adjust the serving size number in the top of the recipe, and it will adjust the measurements for you so you can make as much or as little as you like. Enjoy! I’ve been using vegan lasagna soup recipe from another vegan website — now that I see you have one, I’m excited to try yours! 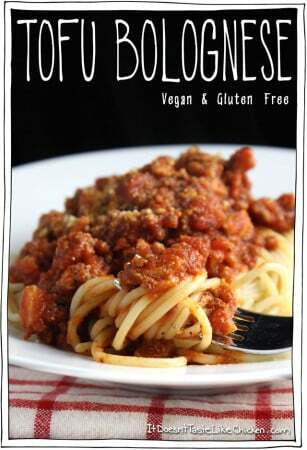 I’ve been topping each bowl with a dollop of your tofu ricotta – it is sooooooo yummy! It is my favorite vegan meal and my non-vegan hubby also likes it a lot too! I made this today to take for dinner while we are at hockey and gymnastics and my daughter had 2 bowls after school and is taking another bowl for gym snack. I was hoping to have some leftover for lunch tomorrow but it’s almost gone. Thanks fot the great recipes. My kids (which are my vegan challenge) love all the recipes I have made from your cookbook. I made this tonight. It was incredible! I threw a couple handfuls of spinach in at the end, which went well with it. I’m definitely making this again! Trying this right now! My tofu is in the oven and baking as we speak. Will report back shortly! Sam, thank you for these amazing recipes! 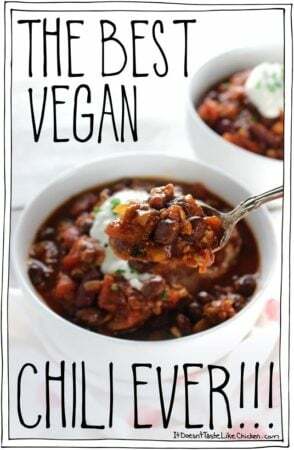 You’re Chili at least a year or two later is still a top favourite (we double it and make it at least once a month). So good! Amazing!!! Hands down, best, easiest soup ever!! 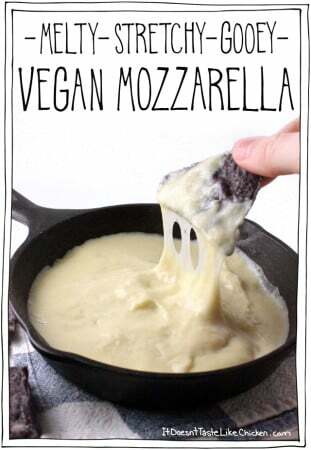 Must have it with the stretchy mozza recipe though, it just adds the finishing touches. Thank you once again for an incredible 6*** recipe! This looks amazing! Planning to make tonight! Do you recommend pressing the water out of the tofu first? 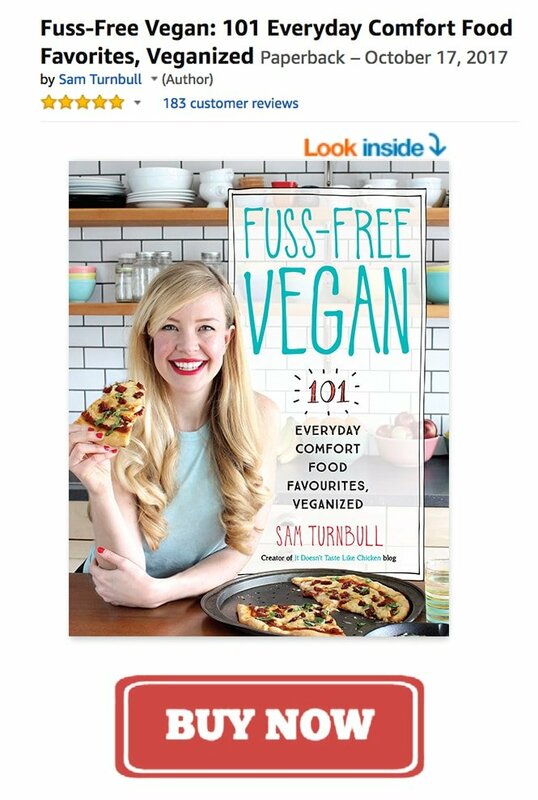 I think she has said in the past that you don’t need to press the tofu because the water will cook out when baking. I can attest to this. I just like to squeeze the tofu with my hands over the sink to get out some of the excess water before I start crumbling. thanks for the nutritional values added, sam… good stuff! guess what’s for dinner (maybe a late lunch!) at my house today! i’m gonna pre-star… this has all my faves in it… and it’s soup!